A simple dream: to stand on a snowy mountain. People travel to our Bed and Breakfast in the Berkshires for all sorts of reasons. Some come here to be close to Tanglewood and the Jacob’s Pillow Dance Festival. Some come here to immerse themselves in the natural beauty of the Berkshires. And some come here to make a dream come true. We recently hosted a guest who was here for just that reason. This woman was fighting cancer, and the cancer was gaining the upper hand. Her dream was to stand on top of a snowy mountain and take in the view. We contacted all the ski areas in the region, and they were all eager to help. In the end, it was Jiminy Peak that was best able to accommodate her. She rode to the top of the mountain on a chairlift, saw what she wanted to see, and then made the journey down. 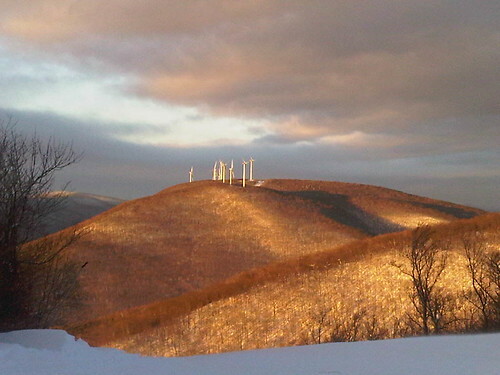 Somehow, the fact that Jiminy Peak produces much of its energy from a wind turbine made the adventure that much better. We can’t guarantee that all of your dreams will come true when you stay at our Berkshires inn. We can, however, help you realize some of them. Do you dream of finding a bottle of wine or champagne in your room upon arrival? It can happen. Do you dream of having a Swedish massage during your stay? All you need to do is ask. Sometimes it can mean a lot to have people in your corner when you travel. Consider us those people in the Berkshires.